Brie Larson was hanging upside down and suspended by her legs when she was about to attempt one of her most challenging ‘Captain Marvel’ stunts for the first time on set. It’s true. Before the Oscar winner was cast as one of the most powerful heroes in the Marvel Universe, Larson was “never particularly active,” she admitted. Despite not being able to do a push-up or pull-up at the start of her training, Larson achieved her goal of performing most of her own stunts for one of the most anticipated movies of the year, out March 7 in the UAE. Larson’s initial inspiration was not a fellow superhero actor, but Emily Blunt in Warner Bros’ ‘Edge of Tomorrow’. She actually tracked down Blunt’s trainer, Jason Walsh, and asked him to help her. Walsh, who trained Emma Stone for ‘La La Land,’ Alison Brie for ‘GLOW’ and Bradley Cooper for ‘American Sniper’, turns down more work than he takes on due to time-frame issues. He often gets requests from studios to train actors “to be in top shape” with just a few weeks’ notice. If you have watched one of the ‘Captain Marvel’ trailers, you might have noticed that Carol Danvers has a rougher fighting style than other women in the Marvel Cinematic Universe. That was intentional, says Garcia. Advanced: Hold a 4.5kg weight above your hips as you lift and lower. Keep your movements slow and controlled and add more weight as needed. Superhero: Larson worked her way up to weighted, 181kg hip thrusts, Walsh said. Superhero: By the end of her training, Larson could do push-ups with 22kg, weighted chains on her back. Superhero: Marvel’s frontwoman eventually executed these with 27kg dumbbells in each hand. Superhero: “She got to a 225-pound [102kg] deadlift, which is insane,” Walsh said. The lines between actress and real-life superhero blurred when Larson achieved her ultimate goal: pushing a 2,267kg Jeep by herself. Prepping for ‘Captain Marvel’ wasn’t all done in the gym. “I do think it’s important to say that it took a nutritionist, two different trainers, a paleo meal delivery service, a lot of mozzarella sticks, and a lot of sleep and water,” Larson said. Doughnuts and all. 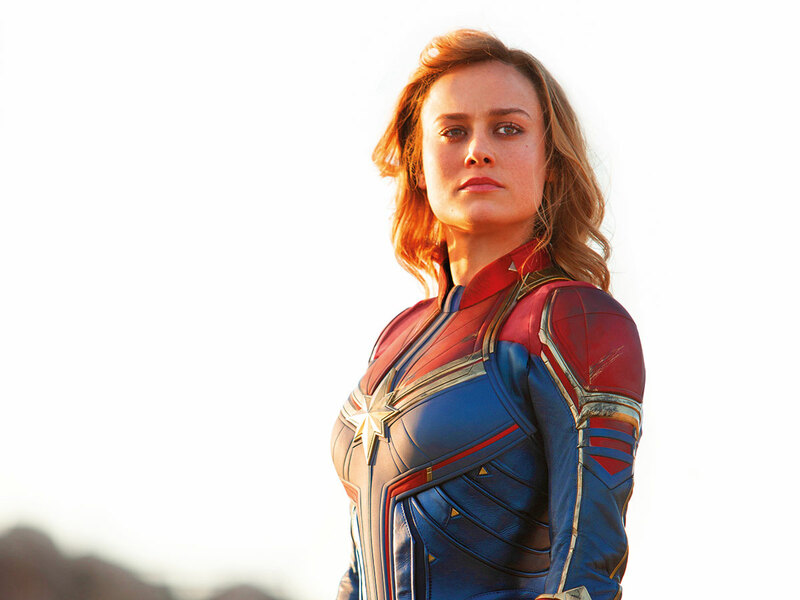 ‘Captain Marvel’ releases in the UAE on March 7.